I have been thinking a lot about narrative and storytelling this week, week 4 in Headless DS106, especially collective narratives and how they evolve. I’ve jotted down some notes about the definition of storytelling, but I haven’t yet posted about it. After reading the assignments, once, early in the week I didn’t spend any time on them at all. Fortunately, #DS106 is a connectivist Mooc, and it is about much more than simply submitting assignments. So I’m not really concerned about not doing the assignments, I know that #talkingheadless106 is focusing my attention on storytelling and media, and how they relate and impact each other. I find myself looking at everything that I do through the lens of narrative. I am enjoying the challenges of the Daily Creates, especially when I can connect them with my daily photo. I think about narrative at work, as I support the #ooe13 community, even as I read the ads on the buses and LRTs that get me around Edmonton. This week I completed two Daily Creates, although a few sounded really interesting and I may still complete them if I find the time. On September 20th I took this photograph featuring a path, road, or trail that leads the eye through it for tdc621. I have several photos in my photo collection that would have been perfect for this assignment, but I wanted to take a new photo. I enjoyed thinking about this assignment in the afternoon and evening. I framed many photos in my mind, rejecting most, but I stopped to take several very different photos, many of which included construction equipment. 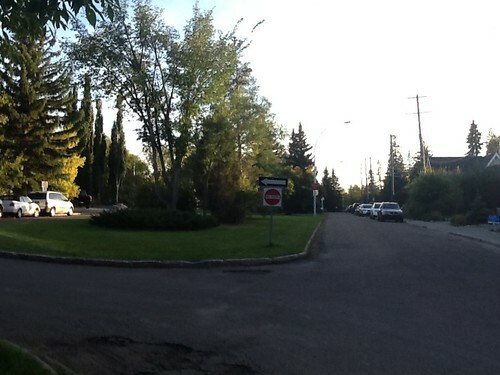 I ended up submitting this photo, which I took right beside the photo I took for tdc605. I like the tension between the sign directing you to the right where the road isn’t visible and the road on the left which draws your eye through the photo. I have been doing a lot of storytelling and talking about storytelling, alone and in face to face and virtual collaborations. At the end of last week I participated in an intense game of Twitter vs Zombies (TvsZ). TvsZ is 140 character word play: “Part flash-mob. Part Hunger-Games. part Twitter-pocalypse. Part digital feeding frenzy. Part micro-MOOC. Part giant game of Twitter tag.” Pete Rorabaugh set up this round of TvsZ as a networked icebreaker for participants in #ooe13. I first heard about TvsZ earlier this year during #etmooc, and I read some tweets with the #TvsZ hashtag last round, but this was the first time I participated. I am working on another post about the game, so I am not going to explain it in detail here. In short, participants share and co-create a narrative by registering, tweeting using the #TvsZ hashtag, and following rules that change as the game progresses over three days. Everyone starts as #human except Patient Zero, a #zombie. #Humans are susceptible to a #zombie #bite within five minutes of the last tweet sent. #Humans can defend themself with a #dodge or someone else with a #swipe as long as they remember to include the Twitter handle of your attacker and the #TvsZ hash tag. It is a great way to get newbies using hashtags, replying, following, directing messages at people, DMing to discuss strategy, and attaching media; although the pace of the game might encourage more lurking than active play in real social media newbies. Pete Rorabaugh and Jesse Stommel created TvsZ as an “experiment in Twitter literacy, gamification, collaboration, and emergent learning.” Because I was vulnerable to a #zombie #bite after posting, I posted much less then I usually do. The narrative that developed was so interesting I lurked a lot, because it required less attention than full participation did. Participating in TvsZ didn’t just change how I use Twitter while the game was underway, it has forced me to think about the narratives that are created by my digital footprint; just like reading Hybrid Pedagogy doesn’t just expose me to new ideas, it forces me to re-examine how I think about everything. This week I participated in two very different events, which were part of a movement, #makesomethingyeg, to tell a specific story about possibilities, Edmonton, and the people who live here. e-Town was a large, but intimate conference about possibilities and connections. As I blogged last week, highlights for me included hearing Chris Hadfield speak and then perform with the Bareknaked Ladies. I love how he has drawn attention to the dialog about space and our place in it through his use of social media. 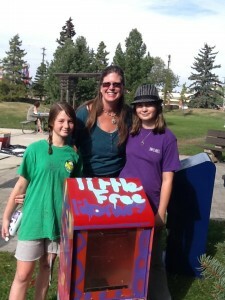 Yesterday the girls and I helped to paint old newspaper boxes for the Little Free Library project in Oliver. 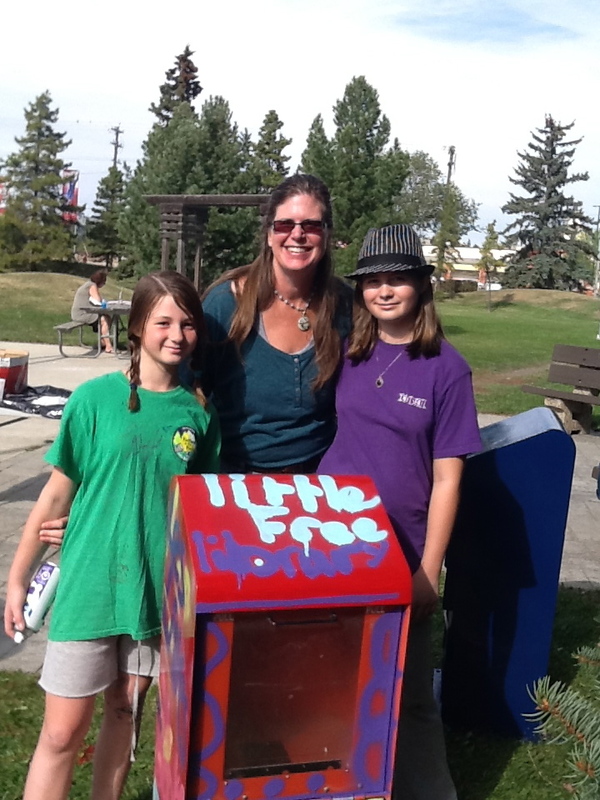 We helped decorate this bilingual beauty which will be a free library. Although vastly different in size, both of these events are part of a movement by Edmontonians to write a positive, empowering narrative of the city. They remind me of a talk I attended in Banff years ago by Dorothy McLean who talked about the angels that have developed in certain cities. I wasn’t able to connect to the devas she talked about in her workshop, but I do believe that if enough people focus their energy they can make a difference. I think that’s what is happening with the Make Something Yeg campaign. 2 Responses to "#talkingheadless106 Week 4: Off-Task but On-Topic"
BE CAREFUL WITH THAT KNIFE! Ummm, what is an “ulu”? Nice to see all your ideas and creations this week. Thanks CogDog. An ulu is a traditional knife used by the Inuit in northern Canada, mostly for butchering and skinning meat. I don’t do much butchering so I use mine for chopping herbs.